Davin de Kergommeaux is a certified sommelier and independent whisky expert who has been writing about, talking about and teaching about whisky for more than a decade. His writing and tasting notes appear in Scotch Whisky Review, Whisky Advocate and on such websites as maltmaniacs.org and whiskyintelligence.com. He is the Canadian editor for Whisky Magazine and publishes comprehensive notes about Canadian whisky on the website, canadianwhisky.org. The Association of Canadian Food Bloggers named de Kergommeaux's website the best wine and spirits blog of 2010, just 6 months after it was launched. De Kergommeaux appears at whisky festivals from coast to coast in Canada and abroad and is a judge in a number of prestigious whisky competitions including the World Whisky Awards. Canadian Whisky: The Portable Expert is the first systematic presentation of Canadian whisky – how it is made, who makes it, why it tastes as it does, its history, and the rich folklore that has developed around it over the centuries. The book is also an informed exploration of taste, so that for the first time, whisky consumers can approach the acquisition of Canadian whisky with a connoisseur’s appreciation of its rich subtleties. Readers take a pan-Canadian journey from British Columbia to Nova Scotia, exploring the multiplicity and celebrating the diversity of Canada’s unique spirit. They learn from carefully researched, reliable and authoritative information that is quite simply not available anywhere else. Through its pages the reader walks the ground, smells the aromas, and discovers the secrets and stories of Canada’s operating distilleries. Along the way, readers hear compelling tales of disasters, sudden triumphs and destructive family feuds that make up Canada’s colourful whisky lore. The turbulent tales that make up the story of Canadian whisky both entertain and intrigue them. And the more they know the more their tastes will be informed. Today’s distillers tell the story of how a tradition adapts to new circumstances. Yesterday’s distillers make their presence felt through their diaries, and their archives reveal their hopes, their dreams, and, yes, their disasters. Real examples from specific distilleries and brands illuminate the details of production. 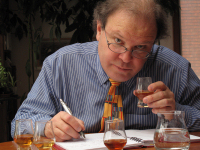 Tasting notes draw on the author’s wealth of experience judging whisky competitions internationally, to provide descriptions that are both accurate and accessible. 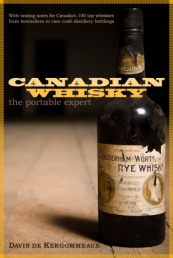 With Canadian Whisky: The Portable Expert the knowledge chasm is bridged. Whisky aficionados need no longer rely on minimal sketchy published details and unreliable web sources that do little more than cite the well-worn myths and paid commercial copy about Canadian whisky. This is the first and foremost authority on all things Canadian whisky. It is the real thing: The independent authority.